The past year we have received several support requests that we found out were related to/caused by (often already fixed) bugs in Excel 2016/365. This article shows information on how to update your Excel installation and also contains links to the Microsoft articles with all the detailed information about what has been fixed and improved by the Excel team. Unfortunately, several bugs were introduced in Excel 2016/365 and Excel's VBA/macro language that could cause slow performance and crashes in Excel (1, 2, 3, 4, 5, 6, 7). Since many users don't use macros themselves, they may only experience such specific Excel bugs (slow speed/crashes) when they use an add-in, such as for example ASAP Utilities, that uses Excel's built-in VBA/macro programming language for its tools and it then seems as if the add-in is faulty. In general, if something goes wrong in ASAP Utilities, you should get a polite error message. It should never make Excel crash. Most of the times updating Excel will solve it already. If a fix isn't available yet from Microsoft, then we try to create a workaround in ASAP Utilities to handle such Excel bugs, because we do not always know how long it will take the Excel team to fix it. 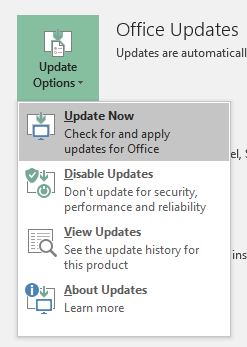 Fortunately Microsoft has already released many updates with fixes related to the performance and stability of Excel 2019/2016/365. 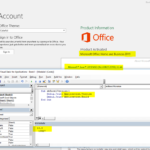 On the following page you can see the most recent changes the the Office 365 products. It shows even the recent ones that don't have their own update article yet on the Microsoft Support website. You can choose to only see the updates that impact Excel. Because there doesn't seem to be a simple page where you can see all the updates/fixes related to Excel, we've created a list with the links to the official articles from Microsoft here. Several of the fixes from Microsoft were related to the performance and/or crashes of Excel. - If a file has multiple cells that use Japanese era dates, Excel 2016 may crash when the file opens. - When a protected workbook and an editable workbook are opened at the same time, copying cells in the editable workbook causes high CPU usage. When you click on a shape within a chart in a protected worksheet and preview a chart style or chart color scheme, Excel 2016 crashes. - When you right-click the Excel icon in the taskbar and select Close all windows, Excel 2016 crashes sometimes. - When you save a workbook that contains external references to cells that contain metadata from another workbook, for example, a rich data type value, Excel 2016 crashes. - When you programmatically copy a very hidden sheet to a new workbook by using the Worksheet.Copy method, Excel 2016 crashes. - Assume that a workbook contains merged cells. When you hide, filter, or outline rows in the workbook, Excel 2016 may freeze. - When you show details of a collapsed group by clicking the Show Details command, Excel 2016 may freeze. - When you convert a large range of cells from Text to Number, Excel 2016 may appear to be frozen. - It may take a long time to delete columns that contain merged cells. - Excel hangs intermittently in some cases. 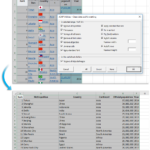 For example, Excel hangs when you paste many pictures into a worksheet and type text into cells. It also hangs when you paste a picture into a worksheet and then resize or move the picture. - Excel hangs in specific cases. For example, tapping near the New Sheet button in a workbook on a touch-enabled computer can cause Excel to hang. - Assume that you open several Excel workbooks in Protected view. When you unprotect and edit one of them, high CPU usage occurs. When you open a worksheet that contains an external reference that includes metadata, for example a rich data type value in Microsoft Excel 2016, Excel crashes. You may experience intermittent crashes in Excel during background error checking after you copy sheets between workbooks. You may experience unexpected issues in Excel 2016 that has multiple third-party add-ins loaded. For example, you may be unable to save a workbook to a mapped network drive.